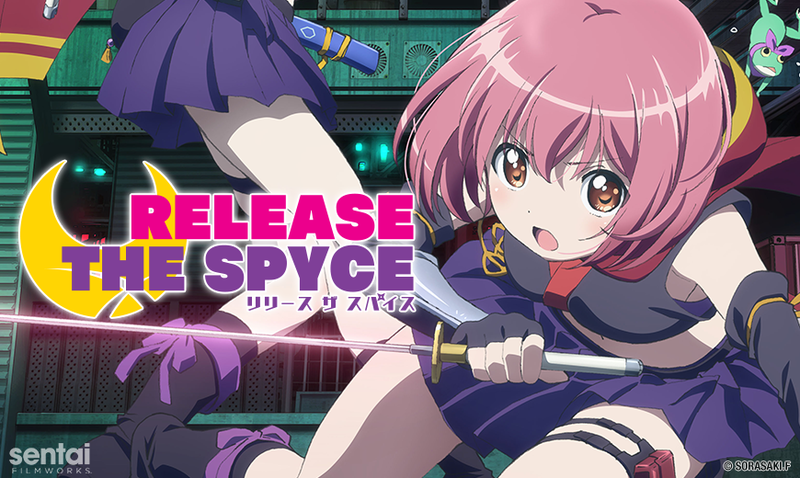 HOUSTON, TX September 28, 2018 – Sentai Filmworks announced today it acquired exclusive rights to the original series, RELEASE THE SPYCE, for the USA, Canada, New Zealand, Australia, the UK, South America, and other select territories. The series’ animation production is led by Lay-duce (Fate/Grand Order: First Order, Magi: Adventures of Sinbad). To everyone around her, Momo lives a quiet life of solitude: going to school and keeping to herself. To the members of the private intelligence agency Tsukikage, she is their newest recruit, learning to hone her skills to help fight against a global crime organization. Under the guidance of senior member Yuki, Momo undergoes a series of dangerous, deadly and diabolical training scenarios and missions. With each victory, Momo’s confidence in her skills grows but it’ll take more than that to help keep not just her home but the world safe. Akira Sato (The World God Only Knows, Deadman Wonderland) will direct the series with Takahiro (Akame ga KILL!, Girls Beyond the Wasteland) in charge of the series composition. Character design is led by Satoshi Ishino (Bleach, Fullmetal Alchemist: Brotherhood). The series will soon be available to stream on select digital outlets for the 2018 simulcast season with a home video release to follow. For Sentai Filmworks’ latest announcements regarding this and other great titles, be sure to like us on Facebook and follow us on Twitter. Sentai Filmworks is a leading global supplier of anime and official anime merchandise, distributing, and curating one of the industry’s most diverse libraries of top trending and classic titles. Offering thousands of hours of content across both traditional and digital platforms, Sentai is dedicated to bringing captivating stories and iconic characters directly from Japan. With hit series that include MADE IN ABYSS, Land of the Lustrous, Big O, and Akame ga Kill!, Sentai’s catalog continues to grow with new favorites like Sword Oratoria: Is it Wrong to Try to Pick Up Girls in a Dungeon? On the Side, Princess Principal, and FLIP FLAPPERS, as well as classic anime series such as Legend of the Galactic Heroes. For more information, visit www.sentaifilmworks.com.